Bitbucket mercurial repository is obsoleted and not maintenance. Please clone from Github repository. 1. Copy the plugin directory into the vendor/plugins directory. This feature now works as project module. So you need set permissions to manage/show/edit template at the redmine settings as administrator. 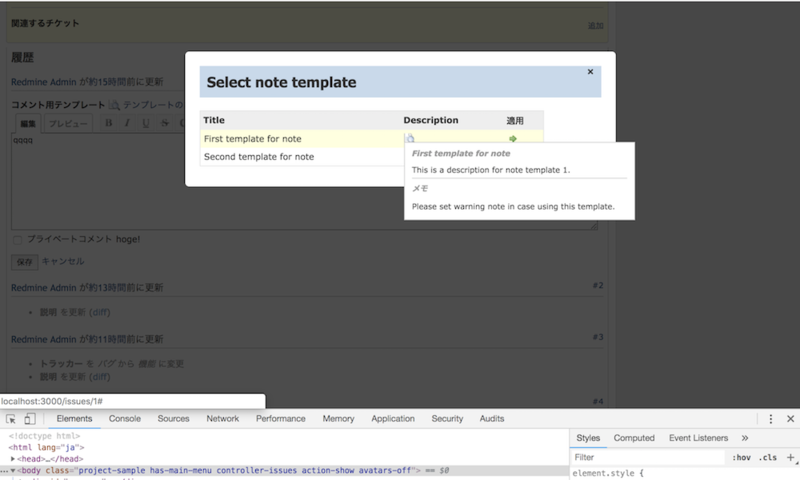 Basic feature implemented of note template. Enabled to use issue templates when updating issue. Go to global template admin setting, and turn on "apply_template_when_edit_issue" flag. Update readme: Merged PR #219. Thanks Arnaud Venturi! NOTE: This version requires migration command to use note template feature. Please use ver 0.2.x or v0.2.x-support-Redmine3 branch in case using Redmine3.x. Show additional navigation message when plugin is applied to Redmine 3.x. NOTE: Mainly, maintenance, bugfix and refactoring only. There is no additional feature, translation in this release. Thank you for creating patch, Mizuki Ishikawa! Mainly, bugfix and refactoring release. Updating to 0.2.1 is highly recommended in case using CKEditor or MySQL replication. NOTE: Migration is required, especially using MySQL replication. Refactoring: Minitest and so on. This is bugfix and refactoring release. Updating from v0.1.9 to 0.2.0 is highly recommended. This version can be applied to Redmine 3.0 to Redmine 3.4. Also some features implemented by v0.1.9 are available. Refactoring: Code format. (JS, CSS) / Update config for E2E test. Applied responsive layout against template list (index) page. 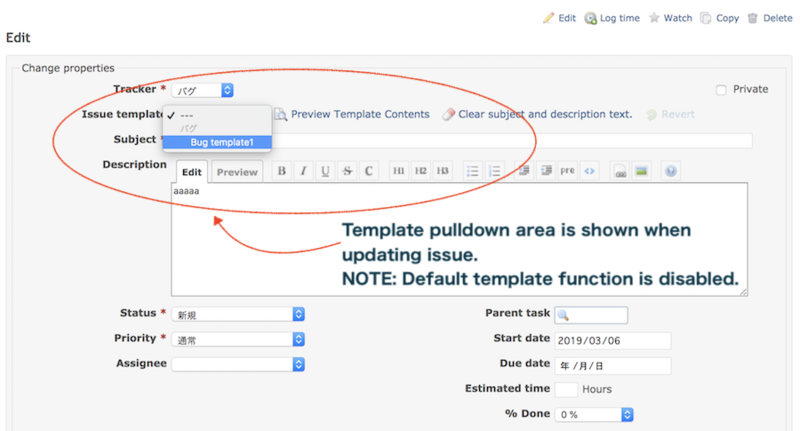 Change UI to reorder templates with using drag and drop. Code refactoring. Use Headless Chrome for feature spec. Change to use CircleCI for build and test. Bugfix release, and some code refactorings. Also orphaned template can be re-associated with another tracker. Compatible with Redmine 3.5.x, 3.4.x, 3.3.x, 3.2.x, 3.1.x, 3.0.x. Maintenance release to follow Redmine's update, and some refactoring related to test, namespace. Download: https://github.com/akiko-pusu/redmine_issue_templates/releases/tag/0.1.6 (zip/ tgz) or clone from Github. Change support Redmine version to 3.0 or higher. Stop to use jbuilder for rendering json. Now any gemfile is not used. PR: UI improvement / Correct CSS. Thanks taqueci! Bugfix: Add exception handler and not to work rake task if rake task name is not specified. Change Template UI related to delete action. Prevent unexpected deletion of template. PR: Add to confirm before replacing description and subject. Thanks, Tatsuya Saito. PR: Fix CSS setting. Thanks, Tatsuya Saito. Updated Simplified Chinese translation, thanks Steven.W. NOTE: Please run “rake redmine:plugins:migrate” task because new column is added. 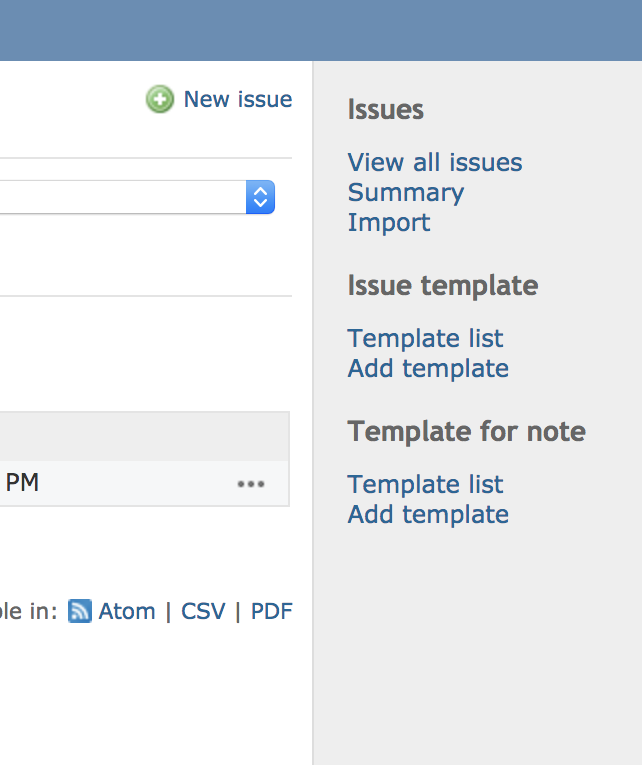 Add feature enabled to mark global issue template as "default". Add plugin setting option to apply global issue templates to all the project. This option is on the plugin configuration screen. Please read help content before activate this option! Change the place of message to notice "default template loaded" now to bottom of the page. Project select checkbox area is collapsed by default. This feature is activated when Checklist plugin is also installed. Updated the German locale. Thanks, jwciss! Info: Support Redmine 3.3.x and Move repository to Github. Update Simplified Chinese Localization. Thanks, Steven Wong. Move repository from Bitbucket to Github. This version is Bug fix release. Special thanks all contributors, and Mattani-san, to this release. Try to use JQueryUI's tooltip. Add Chinese / zh-TW translation file. Thank you so much, Chinese Spporter! Feedback appreciated for global template feature. Add feature to show warning message for orphaned templates. Add Serbian translation. Thank you so much, Miodrag Milic. Add option to change append or replace with template. Feedback appreciated for default template feature. Support inherit templates from parent project. Add links to template list/edit at project setting tab. Add link to erase issue subject and description. Compatible with Redmine 2.3.x, 2.2.x, 2.1.x, 1.4.x, 1.3.x. Enabled to load default template. Show warning message in case no project trackers are assigned. Also Redmine 1.4.x support version was updated to 0.0.2.1. Thak you so much, Viktor Muth, that gave me some feedback. For Redmine1.3 or 1.4, please use version 0.0.2.x. Very useful, thank you. it's working with redmine 3.4.5 very well. It is an indispensable plug-in for operation in my company. I appreciate it because it supports Redmine's upgrade. Just what I was looking for. excellent. Thank you! Hi guys, I`ve had a problem with redmine_issue_templates. It`s looks like this plugin has corrupted CSS in some themes. For example Red-Andy theme goes "crazy dancing" with almost all fields also in admin pages.